Peaches in store jewellery launch!!! Wow, Saturday was the highlight of our year so far! 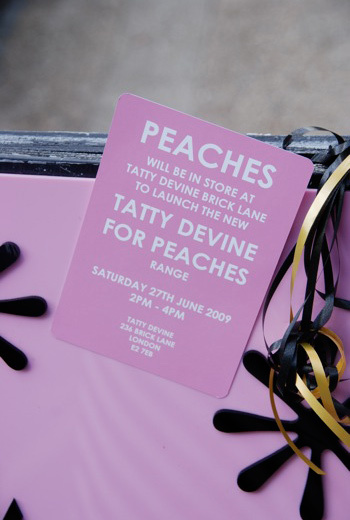 The legend that is Peaches was in our Brick Lane shop to launch our new range of jewellery for her. 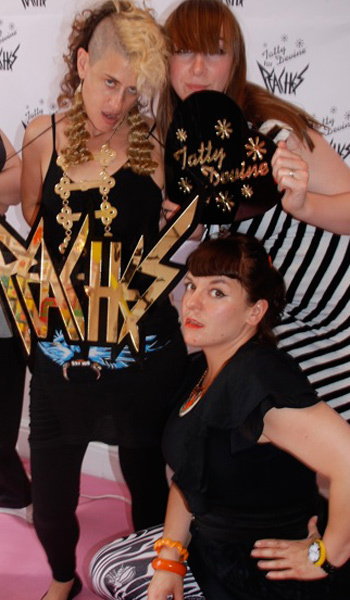 We've been big fans since the first time we saw her in 1999 - when we were just starting Tatty Devine! The shop was looking great in the sunshine as we made the final preparations for the event. Kirsty and Amy made the cabinets and windows look great with Peaches-style gold lame, glitter curtains and mirror balls. We made a massive Peaches logo for the mirror and had some logo wallpaper specially printed. We have been working with Peaches for a while now as we designed the jewellery for her recent US tour, but Saturday was the first day anyone in the UK got a chance to get their hand on the signature pieces. Peaches was with us all afternoon, signing albums, jewellery boxes, bags and even bums! So many people came down to meet the Peach and get their hands on the new album and a Tatty Devine necklace. Peaches was inundated with requests but was totally great and everyone got a chance to meet her and have a picture taken. There we so many lovely looks going on as lots of people were wearing their Tatty Devine pieces already. Some other famous faces also showed up: Sue Denim from Robots In Disguise, Anat from Chicks On Speed and artists Rob Ryan and Mark Pawson. Post punk legends The Raincoats were there too! 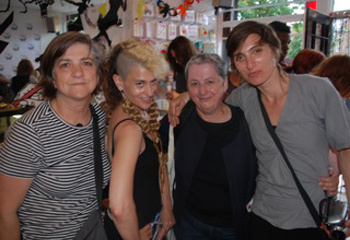 They recently interviewed Peaches for a film they are making - we were pretty star struck, as we love The Raincoats!!! Hairdresser Charlie Le Mindu was there making sure Peaches was looking glamorous as ever, and she was wearing an amazing pair of earrings he had made for her out of hair! We made a massive version of the Peaches necklace to hang in the shop window, and by the end of the afternoon we had whipped out our pliers and turned it into a giant necklace for her. She was loving it and took it with her to wear at Glastonbury, where she was closing the show! We got really excited about other giant show pieces for her, so watch this space for news of bespoke stuff we might make for her shows. We can't wait until she next plays London. 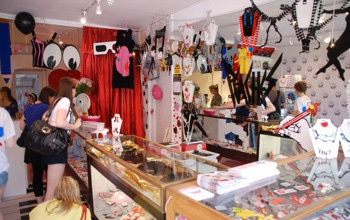 It was such an great day, the shop was really buzzing. Thanks to Amy, Kirsty, Sarah and everyone else from Team Tatty who made the day go so well. We better get on now and make some more jewellery, as it goes online today and we're sure it will be crazy! 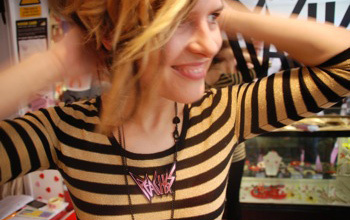 Thanks Peaches, we love making jewellery for you!